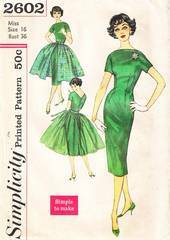 Vintage Simplicity sewing pattern copyright 1958. Sheath dress has bateau front neckline with V back neckline, kimono sleeves and back kick pleat. Gathered overskirt has front opening. Self fabric waistband and bow detail short overskirt. Long overskirt is made of net. Ribbon belt extends to tie at center front.